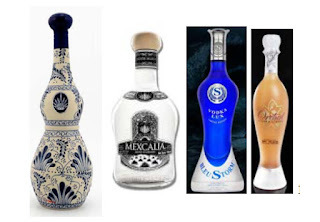 The Board affirmed a refusal to register the "product packaging mark" shown below for "mezcal," finding that the proposed mark is not inherently distinctive and fails to function as a trademark under Sections 1, 2, and 45 of the Trademark Act. In re AGPCH, S.A. de C.V., Serial No. 87125518 (April 18, 2018) [not precedential] (Opinion by Judge Cynthia C. Lynch). whether the proposed mark is a "common" basic shape or design. whether it is "a commonly-adopted and well-known form of ornamentation for a particular class of goods viewed by the public as a dress or ornamentation for the goods" or "a mere refinement" thereof. The Board first considered the relevant field within which to consider applicant's packaging. Applicant argued that the field should be limited to "mezcal" and should not encompass alcoholic beverages or beverages generally. Examining Attorney Melissa S. Winter contended that the field should be broadened to "the beverage industry as a whole." The Board found the "distilled spirits market" to be the most reasonable category of goods for comparison purposes, since retailers group distilled spirits together in presenting them to consumers. The Board concluded that applicant's design "cannot be considered unique or unusual in the field, and constitutes a mere refinement of a commonly-adopted and well-known form of ornamentation for liquor bottles." The first bottle above has "an overall design almost identical to Applicant's 'gourd-shaped' bottle ... with a spherical stopper and what Applicant calls a 'capsule' that spreads down over the neck of the bottle." The next three bottles - for mezcal, vodka, and liqueur - show the prevalence of hourglass-shaped bottles, two of them having a round stopper like applicant's. Other third-party bottles have spherical stoppers and vertical ribs. Many bottles contain neck rings and capsules. The Board found that the differences in applicant's design from these other bottles are "mere minimal refinements of common designs, rather than significant differences from them." Even if applicant is the only current user of its exact combination of features, "this fact alone does not imbue the design with source-identifying significance." The two prior cases cited by Applicant - involving Procter & Gamble's cat food can and Creative Beauty's perfume bottle - each included evidence that the designs there at issue received awards or other recognition. Here, applicant relies only on "its bare contention that the design it intends to use is unique in the field." We find that Applicant’s bottle design gives its product an attractive appearance, and that consumers would not be predisposed to view this relatively commonplace decorative bottle design as source-indicating. *** Ultimately, we find Applicant’s bottle design a commonly-adopted and well-known form in the industry, and the slight differences from third-party bottles merely refine the common design in unremarkable ways or with other common bottle features. The Board concluded that, under the second and third Seabrook factors, the packaging design at issue is not inherently distinctive. And so the Board affirmed the refusal to register. TTABlog comment: Is the winning of awards a good indicator of inherent distinctiveness? Here is a blurb form an OA response I wrote in connection with a perfume bottle configuration application (Reg. No.3875347) In the instant case, Applicant's mark (the bottle which houses its 360° brand of perfume and hereinafter referred to as the "360 Bottle"), was designed by Marc Rosen, an award winning designer of perfume bottles and an icon in the fragrance industry. Id. at Exhibits B and D. In addition to receiving five other awards from the fragrance industry's most prestigious society, the Fragrance Foundation, for his perfume bottle designs, Mr. Rosen was also recognized for the creativity of his design of the 360 Bottle in 1994 for which he received the Best Packaging award for that year. Id at Exhibit D. In determining which design is awarded the Best Packaging award, the Fragrance Foundation considers the following categories: "beauty, impact and consistency of name, bottle, package and fragrance. Id. at Exhibit C. An award of this caliber is not handed out capriciously and arbitrarily. Id. The design that takes home the award must be, inter alia, unique and create a distinctive image. Id. This recognition of the 360 Bottle by the fragrance industry is undisputable proof that the design at issue is not commonplace in the industry, is unique in the field and is not simply a new twist on something old.. Furthermore, Applicant has made of record evidence that the relevant consumer of Applicant's goods recognizes the 360 Bottle as a source identifier. Id. at Exhibit F representing pages from Internet websites that include posts from consumers discussing the 360 bottle. I am glad that the Board is taking a tougher stance against bottle shapes. There are too many registrations for common bottle shapes. Clients do not often ask for us to search for bottle registrations and, as a result, they wind up in a conflict. Also, it is quite difficult to search bottle shapes and to render a decent opinion on infringement. Bottle shapes are better left to design patents. If it is very distinctive, the owner can always pursue a case of trade dress infringement. Also, in my experience, courts don't really know what to do with a case of trademark infringement of a bottle shape.